Here in LA it may be in the triple digits but it’s dark when I go to work and the stores are stocked with pumpkin everything, so it’s clear that autumn is approaching. I love fall flavors but when it’s 102 outside it’s hard to get excited about anything heavy or labor intense. 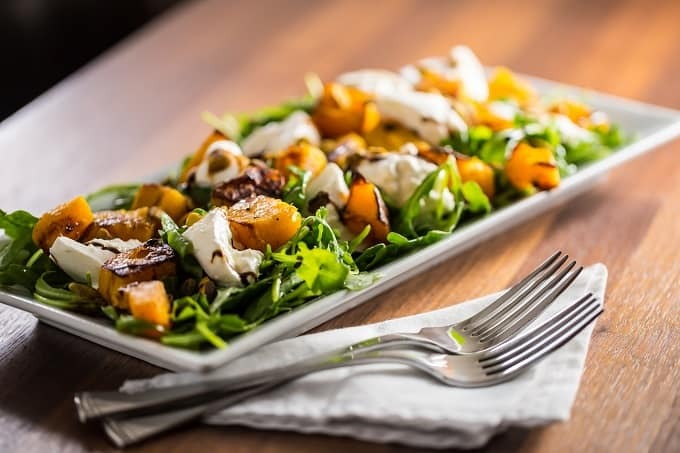 This simple salad of sweet roasted butternut squash, creamy burrata, peppery arugula and a zesty balsamic is just the way to capture some of the best flavors of the season in a light, easy to prepare meal that’s simple enough for weeknights but elegant enough for entertaining. This is already on our menu for Thanksgiving this year. I make things extra easy by using pre-prepped butternut squash and balsamic reduction from Trader Joe’s. I also love that I can roast the squash in my toaster oven and avoid using the oven. In a small saucepan, bring 1/2 c balsamic vinegar to a boil over medium-high heat. Reduce heat to low and simmer until reduced by two thirds, about 20 minutes. Be careful not to let the syrup burn. Note that you can skip this step and substitute bottled balsamic reduction. Preheat the oven to 400F. Toss the squash with 2 tbs olive oil and season with salt and pepper. 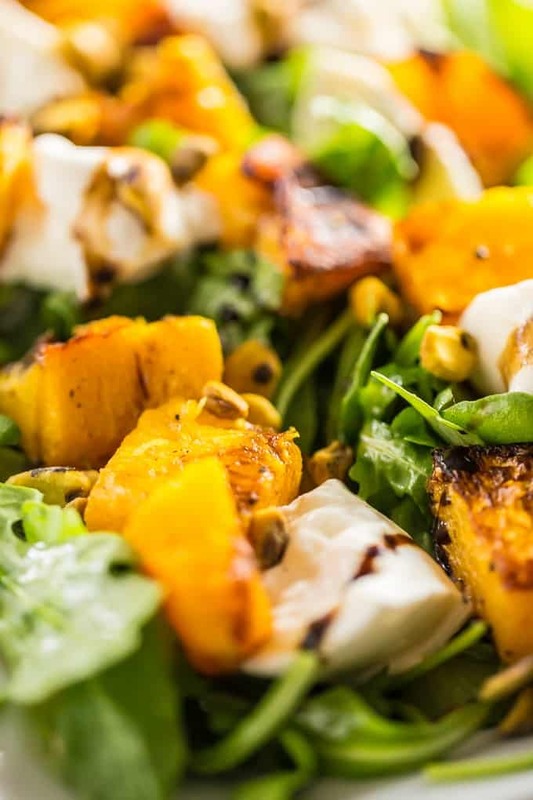 Spread squash in an even layer on a foil-lined baking sheet. Bake, stirring occasionally, until squash is golden and barely charred, about 25 minutes. In a small bowl, whisk together 3 tbs olive oil and 1 tbs white balsamic vinegar. Season aggressively with salt and freshly ground black pepper. Toss the arugula with half the vinaigrette and arrange on a platter. 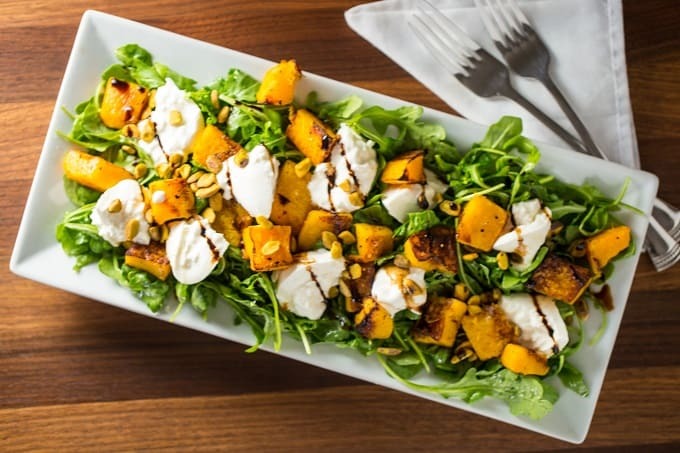 Top with butternut squash, burrata and hazelnuts. Drizzle with balsamic reduction and additional vinaigrette. Thanks to Food52 for the inspiration! 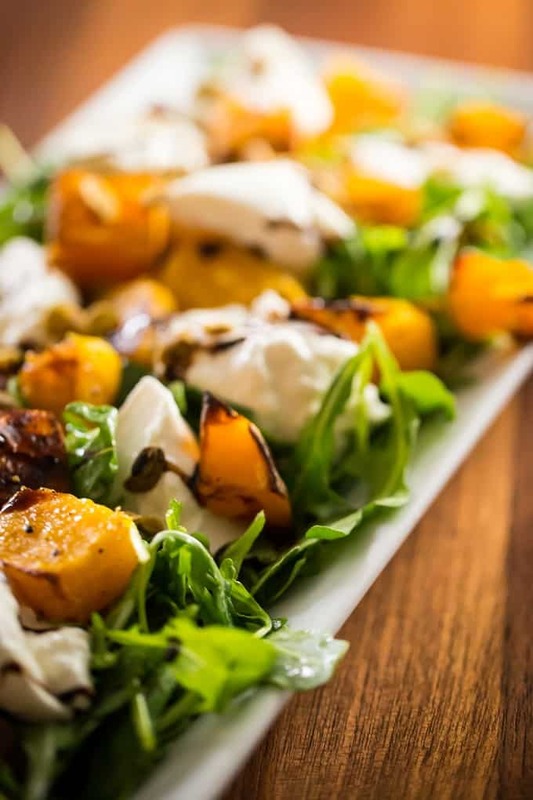 The ingredient list doesn’t list Burrata … what is the quantity to use? Holy cow! Shame on me. It’s two large balls. I’ll update the recipe. Thank you, Rose! !